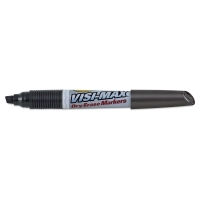 The bold colors in Visi-Max markers make them visible from anywhere in the classroom, office, or conference room. The broad tip markers have a durable tip that is larger than normal for making broad marks — or choose the fine tip for creating crisp lines. 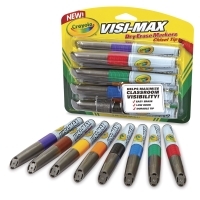 The smooth-writing, low-odor ink in Crayola Visi-Max Dry Erase Markers lays down plenty of color on all standard whiteboard surfaces, without staining or ghosting. Set of 8, Assorted Colors, Broad Tip — This set includes one each of Black, Blue, Green, Red, Purple, Brown, Yellow, and Orange. 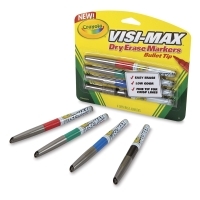 Set of 4, Assorted Colors, Fine Tip — This set includes one each of Black, Red, Blue, and Green. 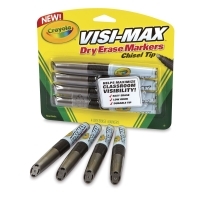 ® Crayola is a registered trademark.™ Visi-Max is a trademark.